Mammoth Cave National Park’s vast underground world showcases giant vertical shafts, from the towering 192-foot-high Mammoth Dome to the 105-foot-deep Bottomless Pit. Some passages and rooms are decorated with sparkling white gypsum crystals, while others are filled with the colorful, sculpted shapes of stalactites, stalagmites, and other cave formations. Underground rivers, including Echo River and the River Styx, flow through Mammoth’s deepest chambers. And in the cave’s absolute blackness dwell many rare and unusual animals, including eyeless fish, ghostly white spiders, and blind beetles. Mammoth Cave National Park’s surface beauty should not be overlooked. Aboveground, Mammoth offers 53,000 acres of scenic parkland perfect for hiking, fishing, paddling and wildlife viewing. Buried within a thriving second-growth woodland forest, you’ll find extraordinary and unusual ecosystems in the bowl-shaped sinkholes, hemlock groves, and wetlands scattered throughout the park. You’ll also encounter Big Woods – a 300-acre old-growth forest – with massive trees that are over 100 feet tall. Keep your eyes out for common woodland creatures like deer, raccoon, opossum, gray squirrel, rabbit, woodchuck, muskrat, beaver, red fox, coyote, owls and wild turkey, but be careful not to disturb some of Mammoth Cave’s most precious endangered animals, that include the Kentucky Cave Shrimp, the Indiana Brown Bat, and seven species of freshwater mussels. Along with its stunning natural splendor, the Mammoth Cave area boasts a rich and colorful human tale that began 2,000 to 4,000 years ago. It’s a fascinating story that features ancient miners, pre-historic mummies, saltpeter mines, the first underground tuberculosis hospital in history, trapped cavers, clever guides, the birth of modern tourism and the creation of America’s 26th national park. Mammoth Cave National Park’s 53,000 acres offer many opportunities for recreation. 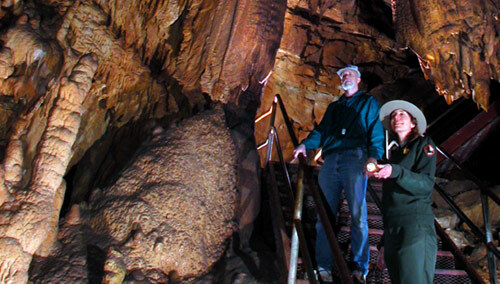 Cave tours are available throughout the year for everyone – young and old – regardless of physical ability. Tours range from 1.5-hour strolls to six-hour adventures. On the surface, park rangers lead walks to remarkable features like River Bluffs and the River Styx Spring. More than 70 miles of hiking trails cross the park, ranging from easy jaunts around the visitor center to intense treks along the Green River. Other recreational Cave City attractions and activities include horseback riding, hiking, canoeing, biking, bird watching and fishing. In 1941, Mammoth Cave National Park was established to preserve its maze of passages, cavernous domes and pits, underground rivers and lakes, unusual animals and plants, beautiful navigable rivers and rugged topography. On October 27, 1981, it became a World Heritage Site; on September 26, 1990, it became an International Biosphere Reserve. Visitors still come by the thousands, drawn by the dark frontier that is Mammoth Cave.